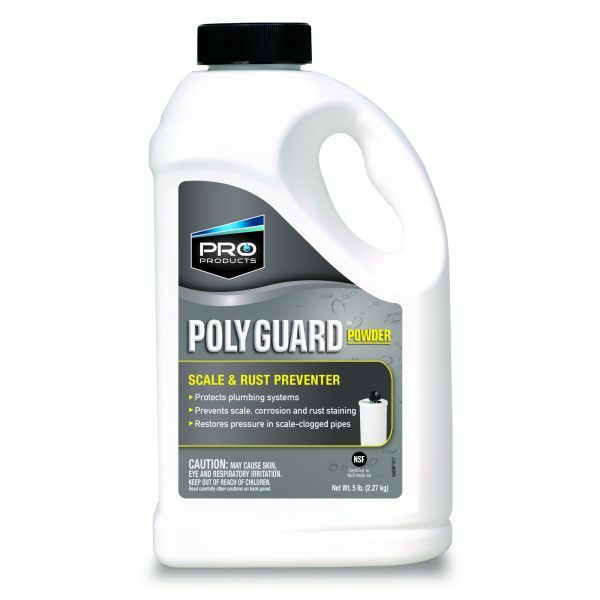 Pro Poly Guard Powder is specifically formulated to prevent hard water scale and iron staining in commercial, industrial and residential potable water applications. The scale preventer powder forms a protective coating on metal and plastic surfaces preventing scale, corrosion and copper leaching. Simply inject Poly Guard Powder by chemical feed pump into the raw water system as close to the source as possible and you are all set! 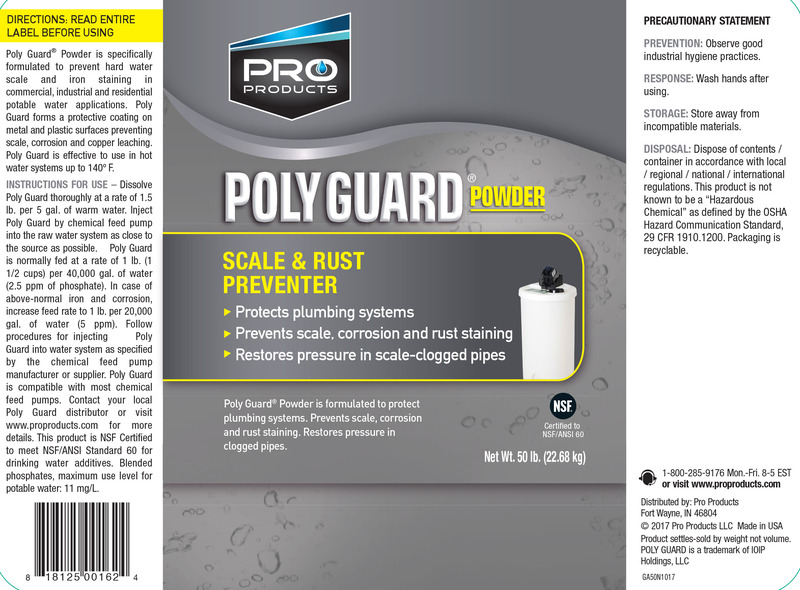 Please note, this Poly Guard product is a scale preventer and does require mixing before use. Pro Poly Guard is NSF Certified to meet NSF/ANSI Standard 60 for drinking water additives. Available in 5 lb and 50 lb sizes. 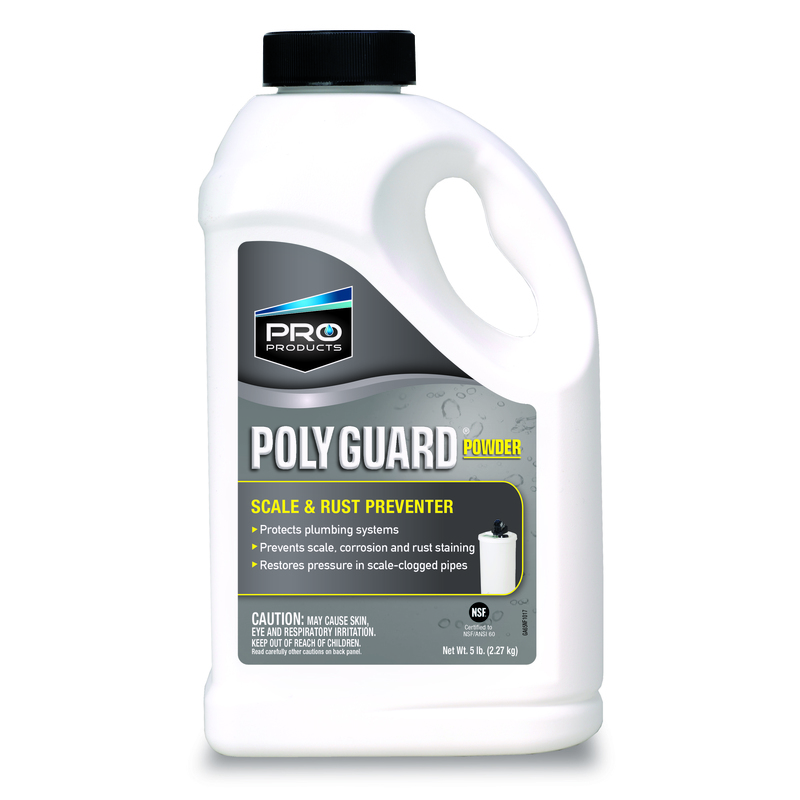 Mixing: Poly Guard scale preventer powder should be dissolved at a rate of 1.5 pounds per 5 gallons of water. The solution should be held in a solution tank and injected into the water system. Corrosion Control: Poly Guard scale preventer powder is applied through a chemical feed pump downline from the well pump. Poly Guard is normally fed at a rate of 1 pound (1.5 cups) per 40,000 gallons of water. The feed rate should increase to 1 pound per 20,000 gallons in above normal iron and corrosion water supplies. Follow the procedure for injecting Poly Guard solution into the water system as specified by the chemical feed pump manufacturer or supplier. For best results, use dosage calculator in tool kit located on the right side of this page. Not sure how much Poly-Guard® to use? Simply fill in the information below and we’ll do calculate the proper Poly Guard dosage. You will need your water test results to accurately determine your dosage; if you haven’t had your water tested yet, fill out this form and send us a sample of your water to test. If you get confused along the way, click on “How do I find this out?” Each one will have directions to ease any confusion. If you’re still having trouble, give us a call and we would be glad to help! - 10 GPM 20 GPM 25 GPM 30 GPM 40 GPM 50 GPM 60 GPM 70 GPM 80 GPM 90 GPM 100 GPM Please select a value for this input. - 10 GPD (.21 GPH @ 50%) 11 GPD (.23 GPH @ 50%) 16 GPD (.33 GPH @ 50%) 17 GPD (.36 GPH @ 50%) 22 GPD (.45 GPH @ 50%) 24 GPD (.50 GPH @ 50%) Please select a value for this input. - 30 100 Please select a value for this input. - 1 2 3 4 5 6 7 8 8+ Call Us Please select a value for this input. - 5 10 15 20 25 30 35 40 Please select a value for this input. contact your local municipal water provider for flow rate. Stenner Pumps have a plate on the side of the base. The Gallon Per Day (GPD) of the pump is listed in the lower right hand box on this plate. Use this number for your calculations and ensure that if you have an adjustable rate pump, that the arrow is pointing to the 5 (50%). Neptune Pumps have a plate on the back and have to be identified by their part number. PZ31 is an 11 GPD pump and the PZ61 is a 22 GPD pump. Use this number for your calculations and ensure that the dial is set to 5 (50%). LMI Pumps have a plate on the back and have to be identified by their model number. P03 is a 10 GPD pump and the P05 is a 24 GPD pump. Use this number for your calculations and ensure that the dial is set to 5 (50%). 30 gallon tanks are the size of a brine tank or utility trash can and have a drain spout on the bottom. 65 gallon tanks are large transparent tanks with a lid that looks like a "flying saucer." 100 gallon tanks are very large and look like an igloo with a black lid on top. Call your local irrigation or water treatment specialist. You can use the "Do It Yourself" test kit that came with your new feeder system or purchase one from www.cleanwatercart.com and test the water yourself. We can test it. Download the Well Water Analysis Form from the support section of our website. Fill that out to the best of your ability and mail that back to us with 4 ounces of water taken directly from your sprinkler head. Call your water treatment specialist to have your water tested. You can use the "Do It Yourself" test kit that came with your new feeder system or purchase one test the water yourself. © 2019 Pro Products All rights reserved.